Shake before use. 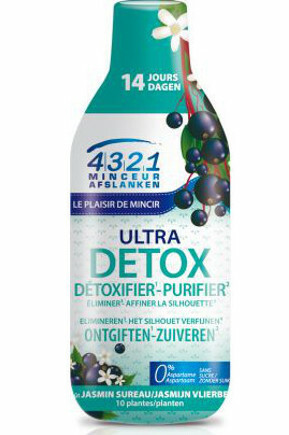 Dilute 1 cap 4321 Ultra Slimming Detox Jasmin Sureau in a large glass of water. To be used in 14 days cure. It is possible to renew the 4321 Ultra Slimming Detox Jasmin Sureau program several times a year. This product can help your slimming program that if used as part of a diet in which total caloric intake is controlled. A dietary supplement should not substitute for a varied and balanced diet and a healthy lifestyle. A slight deposit, due to the natural characteristics of plants may occur but does not affect the quality of the product. Ingredients: aqueous extract of plants [obtained from sapwood of lime (Tilia cordata) (490 mg per dose), birch leaf (Betula pendula, Betula pubescens) (490 mg per dose), fennel fruit (Foeniculum vulgare) (490 mg per dose), dandelion root (Taraxacum officinale) (340 mg per dose), flowering tops of Queen des pres (meadowsweet) (340 mg per dose), green tea leaf (Camellia sinensis) (205 mg dose), artichoke leaf (Cynara scolymus) (50 mg dose), leaf orthosiphon (Orthosiphon stamineus) (50 mg dose) and root of black radish (Raphanus sativus) (50 mg dose)] - Water - elderberry juice concentrate (Sambucus nigra) - Aroma jasmine - Preservatives: sodium benzoate, potassium sorbate - acidifier: citric acid - Sweetener: sucralose. Contains caffeine (content of about 5 mg per day), not recommended for pregnant or lactating women. Not recommended for people with allergies to salicylate derivatives. To be taken preferably with meals. A dietary supplement should not substitute for a varied and balanced diet and a healthy lifestyle.